Huawei, a global leader in information and communications technology solutions, and Bombardier Transportation, a global leader in rail technology, have together successfully demonstrated a new integrated rail security solution, at Bombardier’s rail test track in Żmigród, Poland. The demonstration was presented January 16, to a large number of European Commission representatives, partners and railway stakeholders as well as representatives of the transport authorities and rail police. The rail security solutions combines Bombardier’s on-board rail security portfolio and wireless gateway solutions, with the broadband data capabilities of Huawei’s eLTE wireless rail communication system. “The integration of smart sensors and multi-network capabilities enables efficient “train-to-ground” communication and cost savings, while significantly refining security processes with the easy detection of security issues, creating a safer and more enjoyable rail travel experience for people”, said Mr. Li Shengli, general manager, Huawei Enterprise Wireless Broadband Department. “Over the past 16 years, Huawei has worked closely with leading rail operators around the world to develop new, innovative ICT solutions that are customized to the unique needs and safety and security requirements of the rail industry. We will continue our investment and research efforts in rail technologies to increase the safety of passengers and the efficiency of rail operators” he continued to say. The communication scenarios presented at the event in Żmigród demonstrated how Bombardier’s on-board communications gateway will connect through a WiFi network connection within train stations if available, using this type of coverage to maximize the benefits of unlicensed Wi-Fi frequencies. 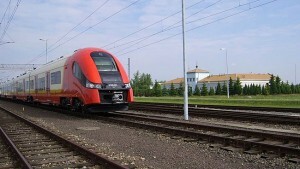 Once the train started moving at a higher speed, or if no WiFi network is available, the connection automatically switch over to a 3G connection to enable transmission of critical data. As soon the train entered areas with wireless LTE coverage, the on-board unit automatically enabled data services such as video surveillance and broadband data to maximize the benefits delivered by LTE for rail. The on-board mobile communications gateway solution from Bombardier, and it’s ability to automatically switch to the best connection type available (i.e. LTE, Wi-Fi or 3G) and Huawei’s wireless railways solution, could potentially benefit railway operators across the world who has the ambition to add seamless train-to-ground communication. Previous Previous post: Philips introduce the world’s first LED replacement for fluorescent tubes that requires no rewiring.